Fascia board replacement is a standard part of a homeowner's roof maintenance. 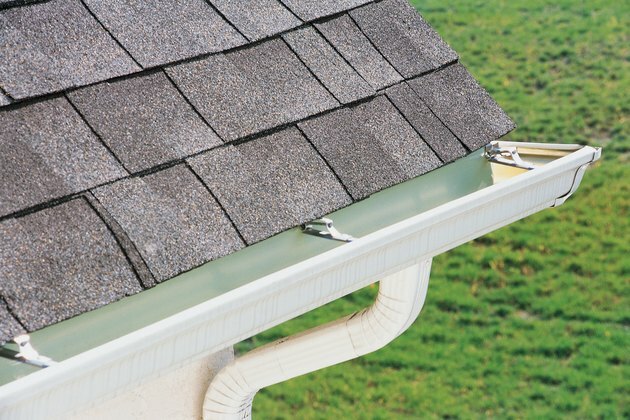 The board attaches to the rafter ends and provides an appeal-enhancing trim that also protects the roof surrounds. Board sizes vary according to the house design but nail sizes are relatively constant. Some builders prefer screws to nails. Gutters hang off fascia boards, so the boards need to be nailed in well. Aluminum fascia manufacturer Rollex recommends nails that can penetrate the wood at least 3/4 inch. It recommends drilling holes in the aluminum before nailing, and the holes should be slightly larger than the nail's shank. Rollex also says not to drive the nails home, but rather leave a 1/32-inch gap to allow for temperature changes. Nails must be aluminum and Rollex recommends nailing them 18 to 24 inches apart, with the first at least four inches from the drip edge. Hardie Trim recommends using a minimum 6d siding corrosion-resistant nail when it's being used to attach its fascia boards to wood frame construction. It calls for 2-inch, 16-gauge, corrosion-resistant finish nails only when you are attaching fascia to double sub-fascia. Nails should not be closer than 1 1/4 inches from the edges and no nearer than one inch from the ends. With pneumatic nailing, Hardie Trim recommends driving the finish nails flush. Replacement fascia requires 4d galvanized casing nails. After taking off a whole damaged fascia board, cut away all damaged wood and prepare to reinstall what good part remains; miter-saw the good part of the old board at a rafter connection. Use 2-inch galvanized deck screws to reattach the remains of the old board. Cut a new board to miter in with the old, and secure it to the rafters in a nail-lock joint with 4d nails. Hometime.com recommends using screws instead of nails when replacing fascia to avoid jarring the existing framing with hammering. You must use exterior grade nails. A finishing nail, which has a smaller head and can be countersunk, will give a clean look but nails with a head will be more secure. You can hammer it farther into the wood and cover with putty, caulk or wood epoxy before you paint.